The ancient seaport and the modern holiday resort of Whitby, lies on the edge of the North Yorkshire Moors at the mouth of the River Esk. The East side with its narrow cobbled streets and fishermens cottages is perhaps more steeped in history than the relativley modern West side. This ancient fishing port boasts a thousand years of ecclesiastical and maritime history. The town is divided into an East side and a West side, connected by a swing bridge. Hotels and Guest houses plus attractions like Pannet Park, the Art Gallery and Museum, the Leisure Centre and Pavilion Complex dominate the West Cliff, built predominantly by Hudson "The Railway King". Whereas the old town, with the Town Hall, Market place, 199 Steps leading to the Parish Church of St. Mary the Virgin and Abbey ruins, is situated on the East side. 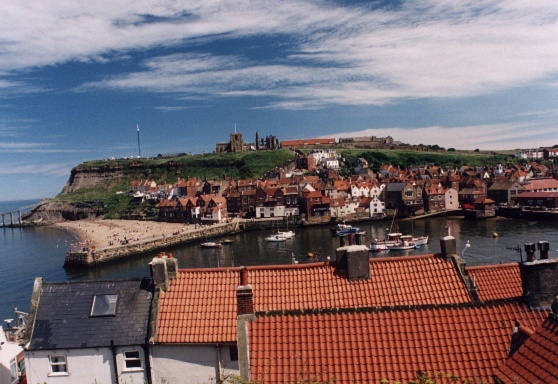 Whitby is part of what has become known as the Dinosaur Coast. From the high cliffs at Boulby in the North West, to Ravenscar in the South East, there is practically the whole series of Lias rocks, with the exception of Planorbis and Angulatus. Bare strata has been left as a result of the long abandoned Alum workings which reveal fossils that would not otherwise be seen. Extinct shell fish Ammonites can be seen in abundance imprinted in the rocks outside the harbour. The Harbour is still a busy place filled with all manner of craft and the yellow dredger "Sandsend" can be seen waging a constant battle against the build up of silt and mud. The small and hard working fishing fleet is in evidence in the Upper Harbour and there are several craft available for short trips out to sea or for longer fishing trips. At one time Whitby was the sixth most important port in Britain, with Whaling, Shipbuilding, Sail making and Rope making bringing much prosperity to the town. Today Whitby is associated with Captain Cook, Bram Stoker, Dracula, Vampires, Goth weekends, Folk festivals, and a superb beach, but most importantly, relaxing and sampling the superb atmosphere of this unique little town. Discover the distinctive architecture, comprising of fisherman's cottages, narrow cobbled streets, lanes, yards and ghauts, many dating from the medieval period. Gourmet food stores and restaurants jostle with the little shops offering all manner of original works and souvenirs. The towns maritime history is evident all around, from the arch made from a Whales jawbone and the Captain Cook monument on the West cliff to the Cook Museum in Grape lane and the Fisherman's cottages on the East side. One of Whitby’s premiere venues for live music, on most Saturday evenings throughout the year. Enjoy a drink from the Bar 7 pm until late. Music from the Sixties to current era.